If you remember the British cooking series, Two Fat Ladies, of PBS and BBC fame, you’ll immediately recognize Clarissa Dickson Wright as the taller of the two, not the proud chainsmoker who passed away from lung cancer in 1999. Dickson Wright is the co-author of The Game Cookbook with Scottish farmer and outdoorsman, Johnny Scott. A gorgeously illustrated review copy sent to us by the publisher, The Game Cookbook takes standard table game and puts a variation on it that brings out the best qualities through innovative experimentation, with classic recipes and those that seem to have been magically created by neighbors on the other side of the authors’ hedge. 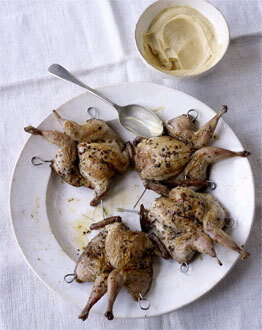 Included are recipes that are very traditional in the UK and Europe. Others reach to the Middle East and South Asia, modified from recipes based in preparing more traditional farm-raised meats. Well-read and always willing to tell a story, Dickson Wright colors the recipes with asides of family histories and remembrances of foreign travel and meals had with friends. You’ll find that it’s very much a UK book with such references as “wapiti”, which those of us in the US and Canada recognize as elk: what they call elk in Europe and the UK, we call moose in North America. The artwork gracing the pages is a mix of old paintings, of hunting and fishing in North America and Europe, even movie stills (James Mason looks quite dashing with a side-by-side), and then photos of completed dishes just as beautiful as the sketches and historical art. Together they bring to the reader the old and new of game and fish cuisine, along with anecdotes that can prepare the neophyte hunter or angler for their first hunting or fishing experience. At the end of the book is a listing of hunting and fishing organizations in the UK and US, along with a collection of wildlife agencies in the United States. 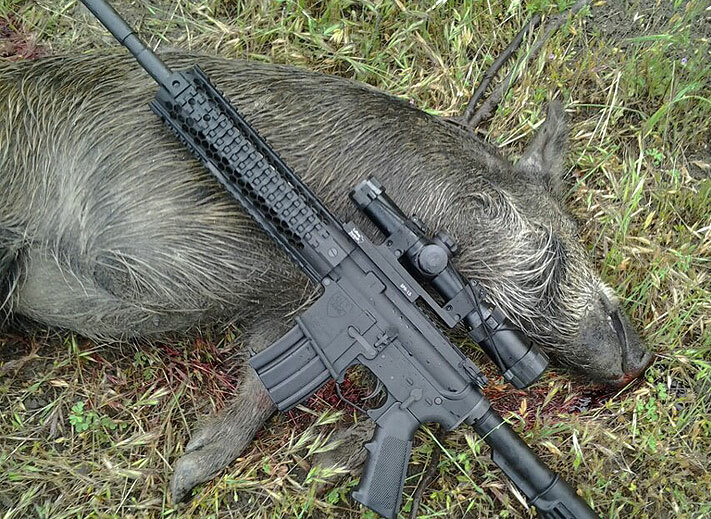 For those who might not be personally able to collect their own main component of a game or fish dish, a listing of game suppliers offering meat farm-raised animals (unlike in Europe, where wild game and fish are sold in many shops, the selling of true wild game in the US has been illegal for years) provides an option. One of the topics that I keyed in on, because it puts so much fear in the new game chef, is aging. In the US of late, as the tradition of hunting has skipped one, two or even three generations, the result of more Americans moving into urban areas in pursuit of employment, the art of aging has been forgotten. If you read some of the forums on the Internet, there’s such an intimidation toward aging and meat contamination that it can sometimes be humorous, sometimes sad…. What would people do if suddenly our refrigerators no longer worked and we were suddenly dumped into a kitchen life experience most families had up until the end of the early part of the last century? Aging was a heavily practiced technique for stretching the day’s take, improving flavor and tenderizing a tough old bird, or side of venison. It all has to do with air temperature and humidity: cool and moist tops the list, and extends the aging time. The author goes through the aging process for just about every meat type taken, from grouse, to pheasant to venison. There are also recipes for those that might not be specifically sought in the US and Canada, but are looked forward to in Europe and the UK, such as carp. There are recipes for grouse, pheasant, elk, moose, antelope, caribou, wild boar, partridge (chukar), quail, dove, American woodcock, snipe, hare (jackrabbit), cottontail, salmon trout, sea trout, zander (yellow perch), pike and of course goose. At the back just before the meat supplier’s list, is a collection of recipes for compotes, sauces and stocks bringing out the best flavors of the dish. 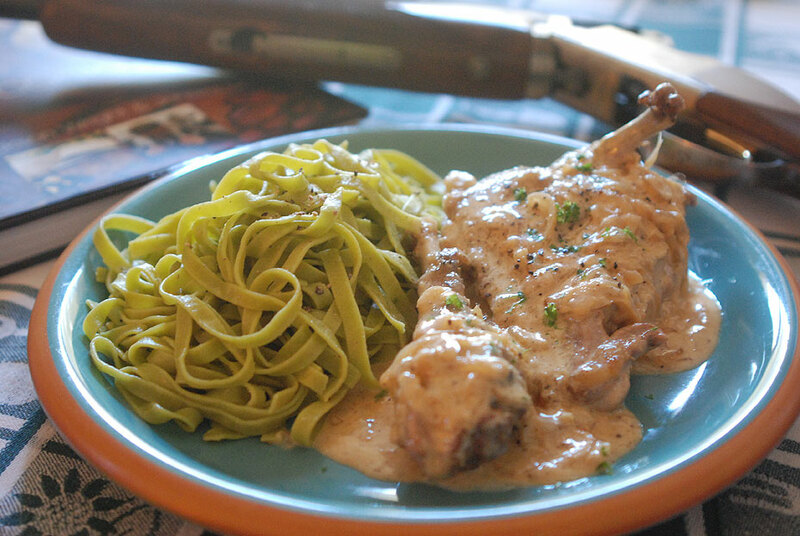 When it came to testing a recipe, I decided it was time to use one of the many pheasants that Ziggy had pointed out for me last year—the dish quick to prepare and a rich, creamy mix of flavors! A bit sweet. A bit tangy. All delicious! 2 tbsp bottled horseradish, or 1 tbsp strong fresh horseradish, grated. Sprinkle the chopped parsley on top. In 1972, I arrived in Singapore to attend the Singapore American School and soon after was introduced to a documentary film, called Future Shock, based on a book by Alvin Toffler and narrated by Orson Welles which was taking the US by storm. As a child, it totally freaked me out….perhaps one of the reasons I avoided computers until I could avoid them no longer. At that time there was also a large movement to get back to basics. It revealed itself in the very large “Ecology” movement of the 1970s (remember the riff on the American flag, in green with the Greek letter ‘Theta’ where the stars and blue background would have been? ), and publications like The Foxfire Books, a collection of stories detailing life in Southern Appalachia. I still have my father’s copies that he picked up on visits back to the States. It’s full of information on woodcraft and pre-supermarket self-reliance. They even showed how to properly scald a pig, which I used in this episode of Cork’s Outdoor TV on roasting a pig. I’m reminded greatly of the back-to-basics movement of the 1970s, by these latest “slow food” and “green food” movements recorded by Michael Pollan and Paul Bertolli. What could be better than eating food that led to a slower and more relaxed society? But, so much information has been lost due to the increasing lack of family histories and traditions being handed down through live practice, i.e. on a farm or ranch. So many generations have moved off the land and into cities. Nowadays, most slow food information is that carried into the US by new immigrants from Asia and Latin America. This is a pity as there was a lot of slow food information held in the family lines that came here from Northern Europe. In March of this year, I had the opportunity to complete a phone interview for Cork’s Outdoors Radio with one such food authority on her latest book on getting back to the basics (be sure to listen to the audio and watch the show below). Darina Allen is noted as the “Julia Child of Ireland” and has been entertaining and educating on the subject of cooking in Ireland and the United Kingdom through her TV show and a collection of books. 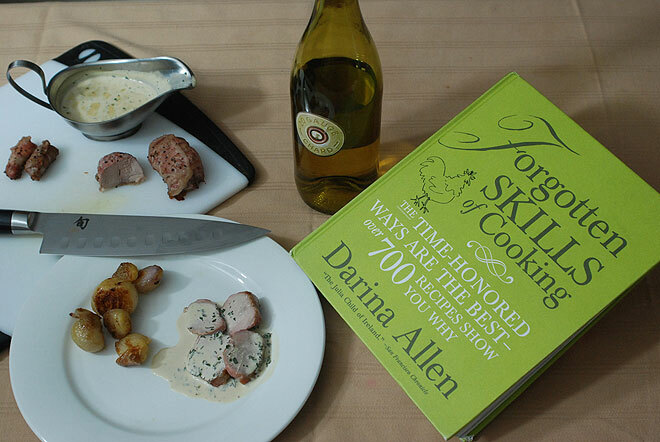 Her latest book, Forgotten Skills of Cooking: The Time Honored Ways are The Best – Over 700 Recipes Show You Why, is that treasure trove of not only Irish, British, and foods from other parts of the world, like Italian slow food recipes, but also articles and remedies for raising your own chickens for meat and eggs, how to properly butcher large farm animals like pigs, cattle and lambs. It’s a gorgeous book, with photos that took all the seasons to create, evidenced by plants in bloom, and the foods in season. It’s all about being seasonal, Allen says, something clear in how she describes not only those foods that are collected on the farm, but also on a day’s walk in the woods gathering such morsels for the kitchen as nettles, mushrooms and a number of herbs, leafy greens, and berries. Both land and water are covered, with foraging rewards, like limpets that are easily found in the Americas, and are cooked in a number of dishes that incorporate the bounty of the farm and field. 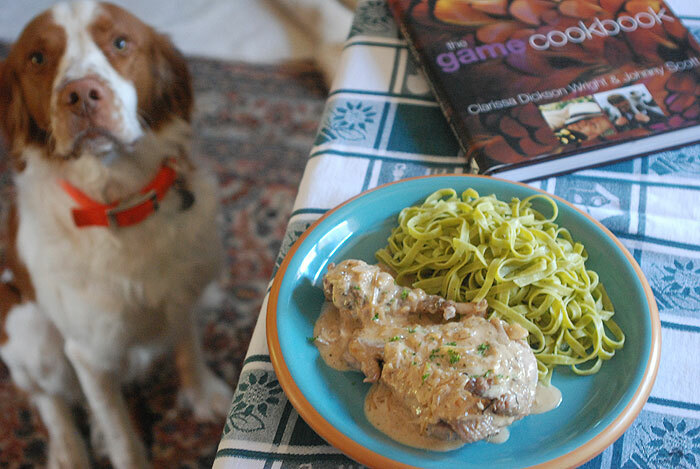 Though spending a lot of time reading through the scrumptious recipes that anyone would easily take a few years preparing all the scrumptious family meals using organic ingredients (either purchased or foraged): pies, breads, puddings, roasts and grilled fishes, I was keen on the game and fish sections. Hare, venison, duck and goose are covered well, both as farm offerings and from the marsh, and of course the obligatory pheasant, but I’d done enough pheasant recipes lately, so I quickly focused on the basil cream rabbit recipe. It was the very cottontail taken with a .22 pellet rifle from Crosman. Who would have thought the hardest part for this recipe was to get the caul fat: Thank God for Dittmer’s in Mountain View, CA! Trim the flap of each saddle, if necessary (use in stock or pâté). Wrap each saddle loosely in pork caul fat. Season well with salt and freshly ground pepper. Preheat the oven to 400°F. Place the rabbit pieces in a stainless steel or heavy roasting pan and roast for 8–12 minutes, depending on size. Remove from the oven, cover, and allow to rest. Degrease the pan if necessary, and put the wine to reduce in the roasting pan. Reduce by half over medium heat, add the chicken stock, and continue to reduce. Bring to a boil, season with salt and freshly ground pepper, and add lots of snipped basil. Serve the rabbit with the basil sauce, caramelized shallots, boiled new potatoes, and a good green salad. Put all the ingredients in a small saucepan, and add the peeled shallots. Cover and cook on a gentle heat for about 10–15 minutes or until the shallots are soft and juicy. Remove the lid, increase the heat to medium, and cook, stirring occasionally. Allow the juices to evaporate and caramelize. Be careful not to let them burn.